Over the years, I’ve travelled many, many times between Saigon and Phan Thiet/Mui Ne: by bus, bicycle, car, minivan, coach, but most of the time, by motorbike. I love the ride along the Ocean Road from Vietnam’s biggest city to one of its most popular beach retreats. But there is another way: put your motorbike on the train and let the rails carry your wheels. It’s cheap, easy, fun, fast, efficient and relaxing. Even if you’re not taking your motorbike with you, the train is a much better option than taking one of the buses along Highway 1. Below is my guide to taking the Saigon-Phan Thiet Express train, for passengers and motorbikes. 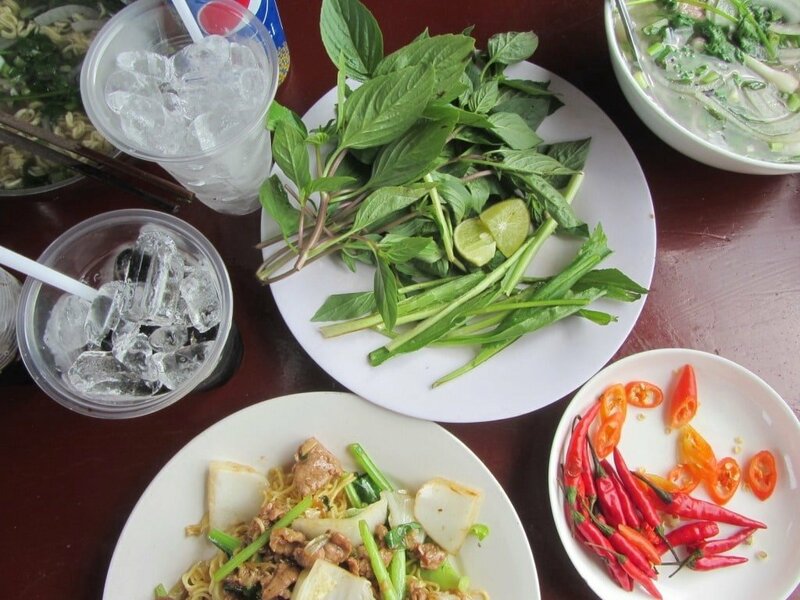 This is a full guide to the daily Saigon-Phan Thiet Express, for passengers and motorbikes. 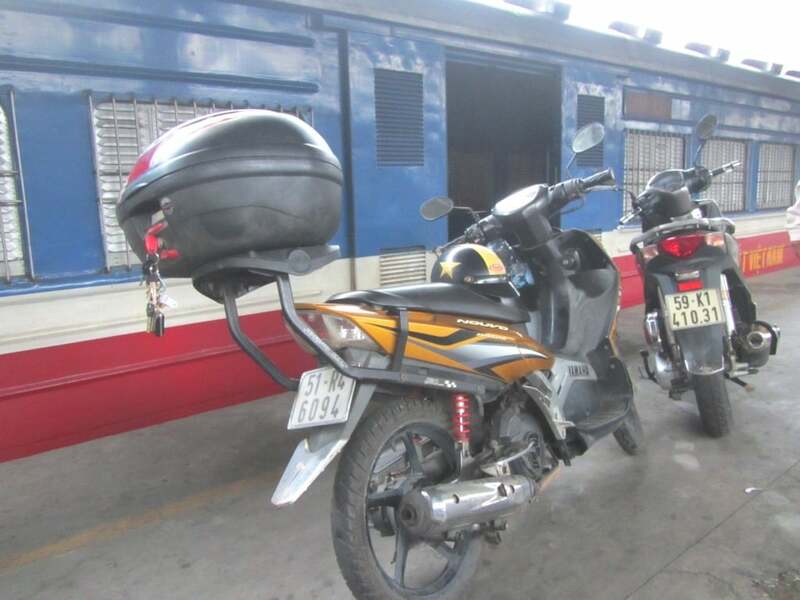 Note that this is one of only a few rail routes in Vietnam that allows passengers to travel on the same train as their motorbike (another being the Hanoi-Lao Cai Express). Below, I’ve organized all the information into separate sections, and plotted the stations, relevant towns, rail and road routes on my map. *Please note: you can support this website by booking train tickets directly from this page: see below for details. *Please support Vietnam Coracle: you can search train times, prices, and make bookings directly from this page by using the Baolau.com search boxes & links throughout this guide. If you make a booking, I receive a small commission. All my earnings go straight back into this website. Thank you. 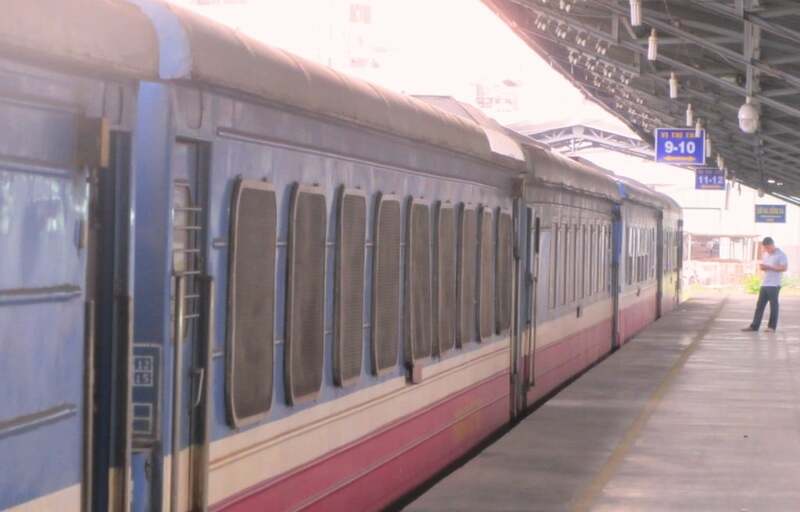 The Saigon-Phan Thiet express service is part of the state-run Vietnam Railways (VNR) network. Vietnam Railways have a decent English-language version of their website (www.vr.com.vn/en) where you can find up to date information. Or go in person directly to Saigon or Phan Thiet train stations, where some staff speak some English. Alternatively, check current train schedules, prices, information, and make reservations through Baolau.com. 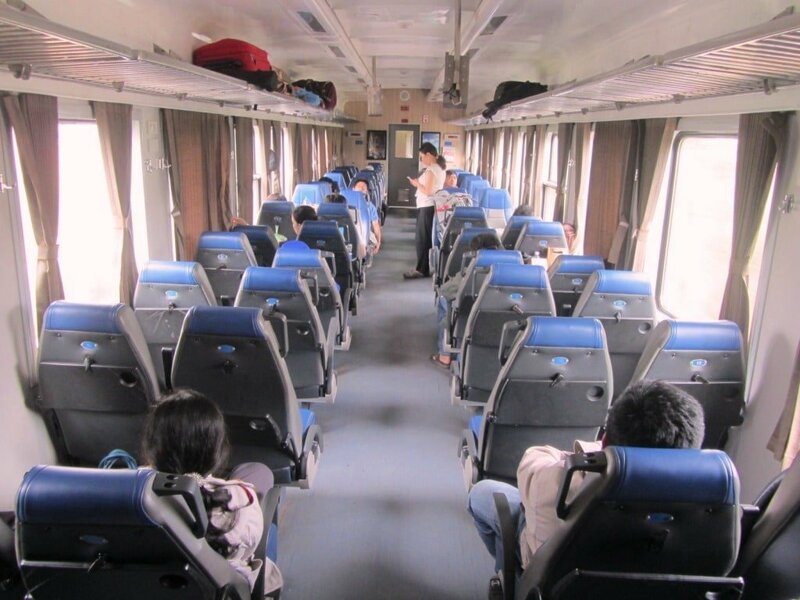 Unlike most other train journeys in Vietnam (read more about that here), the Saigon-Phan Thiet express service allows passengers and their motorbikes to travel on the same train. 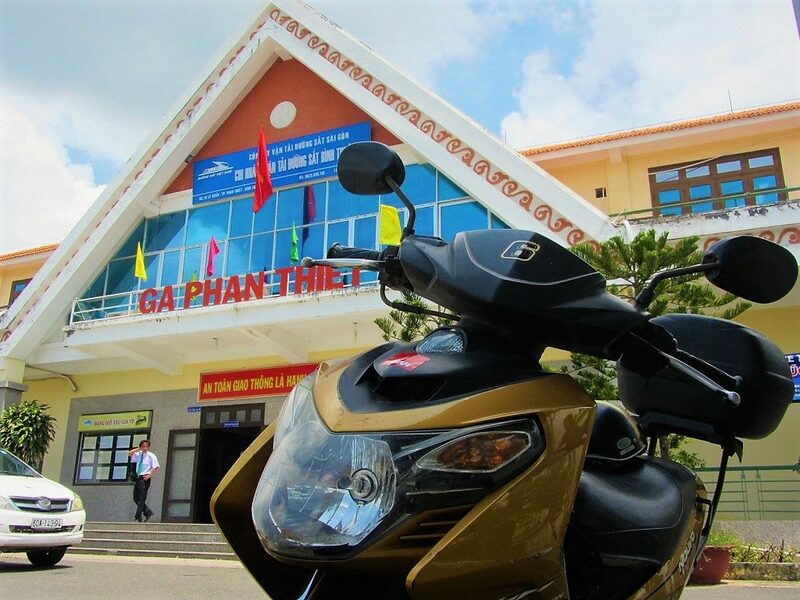 Buy your motorbike ticket directly at Saigon or Phan Thiet train stations; either a day or two prior to departure (advisable) or on the day of travel. This should be a fairly simple and painless process for most travellers, although in Saigon it may require a bit of queuing and patience. (If booking your train tickets through a hotel or travel agency, it’s worth asking if they can also book your motorbike ticket.) Passengers with motorbikes are required to be at the station 30-40 minutes before departure. 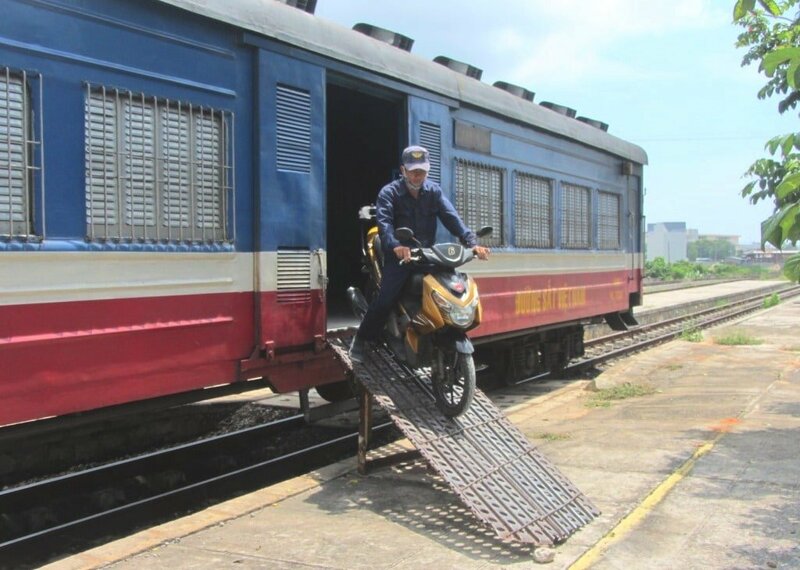 In order to put your motorbike on the train, you must drive through the station gates and onto the platform. At Saigon station, the entrance is to the left of the main station building, signposted in Vietnamese as cửa đi – đón khách tàu Phan Thiết. At Phan Thiết station, the entrance is also on the left of the station building. Ride your motorbike along the platform (which is great fun, although station staff are starting to clamp down on this practice) to the back end of the train. Here you’ll find a few other motorbikes waiting to be loaded onto the freight car. Show your ticket to the handling staff (there’s sometimes a 10,000vnđ ‘handling’ fee) and they will give you a paper receipt for your motorbike: do not lose this. After leaving your motorbike with the staff, make your way to the passenger carriages and find your seat on the train; when you arrive at your destination, stroll along the platform to the freight car, show your receipt, and drive off. The Saigon-Phan Thiet train is an express service: there are no station stops between the the departure and destination stations. However, some trains occasionally make brief stops at Bien Hoa (45 minutes from Saigon) and Binh Thuan (10 minutes from Phan Thiet). Saigon and Phan Thiet stations could hardly be more different: the former is the busy terminus for all southbound trains; whereas the latter is a quiet, almost rural, station at the end of a spur line. SAIGON TRAIN STATION: (Ga Sài Gòn); Address: 01 Nguyen Thong Street, District 3 [MAP]: In the busy back-streets of District 3, Saigon Station is a boring-looking terminus (although the old steam train at the entrance is impressive), but it functions pretty well. Passengers can enter the main building via several entrances; show your ticket at the gate in the waiting hall, and board the train. (See above for motorbike boarding). There are several cafes, shops, and fast food outlets inside the station building. A steady flow of taxis wait outside the front entrance. PHAN THIET TRAIN STATION: (Ga Phan Thiết); Address: Phong Nam, Phan Thiet City [MAP]: A few kilometres northwest of the centre of town, Phan Thiet Station has a pleasantly provincial feel to it. It’s rarely chaotic and very easy to navigate. There’s generally only one train in the station, so there’s no chance of boarding the wrong one. Some light snacks are available from the shop. Taxis meet the trains when they arrive. In the last couple of years, most of the carriages on the Saigon-Phan Thiet Express have been upgraded or, in some cases, are essentially brand new. All carriages are air-conditioned (in fact, it’s a good idea to bring a sweater) and all seats and sleeping berths are soft and comfy (chairs have reclinable backs). There are perfectly adequate toilets and wash basins in every carriage, and the general standard of cleanliness is pretty good. Passengers used to receive a complimentary snack bag containing a bottle of water and rice crackers, the best part of which was the design of the packaging – a good souvenir from Vietnam Railways. However, that endearing little tradition seems to have faded; instead, passengers are presented with a miniature bottle of water. Other endearing traditions, however, endure. For example, about midway through the journey, a steaming trolley of fresh, piping hot sweet corn is wheeled up and down the aisles; so too are freshly boiled chicken and duck eggs. Wonderful. Can you imagine that on a European train? A dining car, towards the rear of the train, sports wooden chairs, large windows, and a surprisingly decent selection of Vietnamese noodles, stir-fries, soups and drinks, all of which are reasonably priced and pretty tasty. Regardless of quality, there’s always something romantic about sitting in the dining carriage of a train, with a bite to eat, a coffee, a book, and watching the scenery pass by. And another Vietnamese train tradition: the second half of the journey often sees Vietnam Railways staff relax with a crate of beer and a pile of freshly cooked seafood (from the fish markets of Phan Thiet, no doubt). As the beer flows and the food is consumed, the volume rises and you’d be forgiven for thinking you were in a raucous Saigon eatery on a Friday night. After rolling out of Saigon station, the train rattles through the city. The driver leans on the horn as the train passes through crowded local neighbourhoods, across busy intersections – the traffic piled up either side of the junction – over the Saigon River and out into the dusty suburbs. Life continues just metres from the tracks, offering a fascinating cross-section of the city: markets, cafes, offices, temples, homes, schools. I used to live in a house near the railway, and each time I heard the horn and rattling carriages, I longed to be on the train. 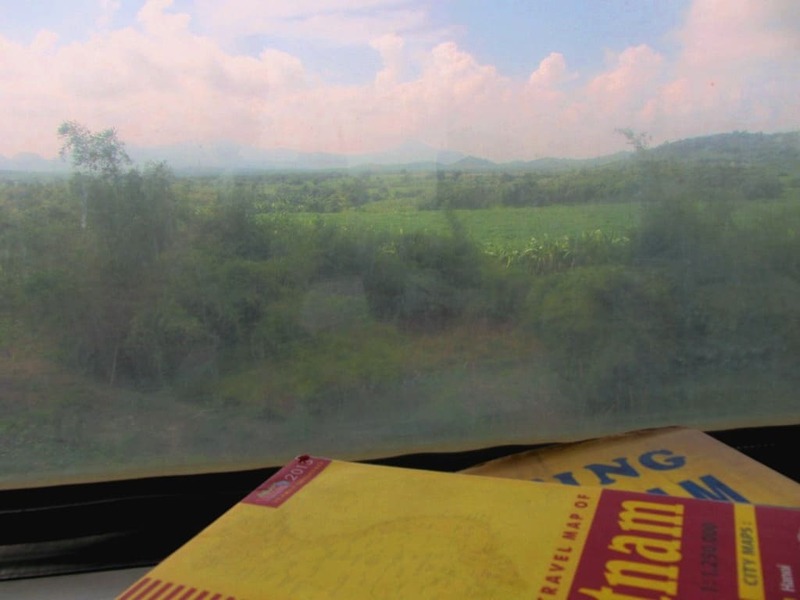 Beyond the industrial armpit of Bien Hoa City, the train makes its way east through an extremely lush landscape of crop fields, fruit orchards, and plantations: banana, coffee, jackfruit, cassava, cashew, mango, rubber, sugar cane, corn and rice all grow within a few feet of the train. Deeper into the journey, green hills begin to rise from the folds of the rolling fields. It’s tropical, exotic, exciting – everything a good train journey should be. The first time I took this train, I was surprised at how lush and scenic the journey is. Usually, when I travel between Saigon and Phan Thiet, I choose to ride my motorbike along the quiet and scenic Ocean Road. The other alternative, which I do my best to avoid, is to take Highway 1; a horrible, truck-choked ride through an arid landscape, obscured by dust and scarred by concrete dwellings lining the road. The train line follows a similar course to the highway, so I was expecting similar scenery. But, because there is only minimal development surrounding the railway, the landscape is green, fairly clean, and sparsely populated. Never have I approached Phan Thiet from Saigon in such a serene, gentle and relaxed manner as by train. Seasons also determine what the landscape will look like out of your window: the late dry season months of April and May are often arid and parched. There is a brief stop at Binh Thuan station, from where the train travels along a spur line to Phan Thiet. 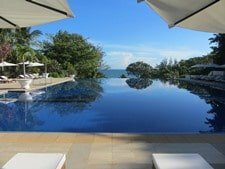 From here, it’s a short taxi ride to Phan Thiet city – an interesting coastal settlement with some great seafood – or the resort-studded coast of Mui Ne. Or, if you have your motorbike with you, you can hit the scenic Coast Road or head straight up to the Central Highlands on Road QL28 towards Juliet’s Villa and on to Dalat. 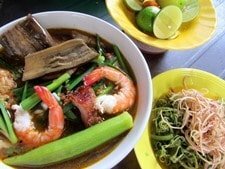 This entry was posted in ALL, MOTORBIKE GUIDES, Mui Ne, Resources, Resources, The South and tagged guide, Ho Chi Minh City, motorbike, Mui Ne, phan thiet, railway, Saigon, train, travel, Vietnam. Bookmark the permalink. Thanks a bunch! Love reading your adventures. I just have a question regarding soft seat and premium; regardless of price, which is better? 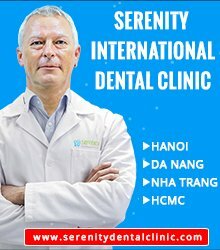 Mirroring all the comments here that your site is beyond helpful for planning a trip to Vietnam. Thank you for all the time spent sharing so much! A lot of work, I’m sure. My son and I are flying into HCM during the beginning of January and, after spending 3-5 days in Saigon, will rent bikes to put on the train to Phan Thiet. My question for you is how much time should we plan to comfortably travel to Hoi An/Danag via motorbike from Phan Thiet? We plan to take the coastal route and head inland if there are any places of interest. We’ll likely fly to Hanoi from Hoi An/Danag and perhaps rent bikes (or to a tour) in the mountains. We’ve heard it’s pretty cold that time of year, but we’re from Chicago, so thinking it won’t be too bad. Yes, it probably will be a bit cold in the mountains in the north at that time of year, but, as you say, nothing like the winters you get in Chicago. In general, people still enjoy their road trips in the north at that time of year, so there’s no reason not to do it: just remember to pack some warm clothes. It’s very difficult to estimate travel time, because it depends on how you ride, how much you stop, the weather conditions, and the route. But anywhere between one week to 10 days is pretty comfortable for Phan Thiet to Hoi An if you take it leisurely and want to stop here and there. 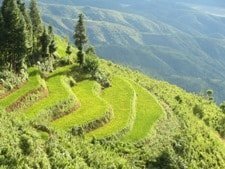 Riders with experience in Vietnam and who don’t stop much can do it in as little as 3-4 days, but there’s not much sightseeing involved when you do it that quickly. Hi Tom, as always, thank you for your invaluable posts. 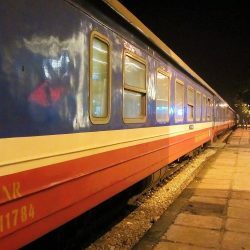 Just to feedback to the community: I’m currently in Phan Thiet, and if you want to buy tickets online for Phan Thiet- Saigon you need to do so at least 18hrs before, afterwards it looks like the train is full but it isn’t necessarily so, it’s just online tickets are no longer available for logistical reasons I guess. I went to the Phan Thiet station early this morning for same day tickets for me and my bike, it’s an adorable station, opens super early, and the attendant was able to help me in basic but helpful English. Soft seat ticket to Saigon was 150000 dong. My bike ticket was 170000. All very easy to do. There is a long almost straight street/alley leading from the “water-port” area to the station. Starting from the station it is called Lê Duẩn and it becomes Cao Thắng. The whole town has no shortage of places to eat and drink coffee but I found this whole stretch particularly endearing. Also, along the water at Lê Lợi street there’s a nice outdoor seated area with many vendors in the morning serving all types of food/drinks. Thanks for the information. Yes, I think that’s right, but it might also have something to do with this being the summer holidays for Vietnamese, and thus one of the busiest times of year for this train route. In fact, sometimes they have two trains leaving at the same time to accommodate all the extra passengers. I think that outside of the summer and New Year holidays, you should be able to book tickets online, even at short notice, although it’s still wise to book in advance. And, as you say, buying tickets at Phan Thiet station is quick and easy. Also, you were right Tom, the train was full. And last, thanks a million for the recommendation about the restaurant wagon, I had a brilliant time there, food was good (great sauted beef & vegetables), loved the corn, and the perfect way to enjoy the train ride. Just wondering if you could ride from Saigon to Mui Ne in one day? (Leaving Saigon at 430am). Or would it be better to stop somewhere mid way? You could stop at Dai Lanh Beach, for example. If you’re planning to stay on the routes that I suggest on this website to get between the places you mention then some of those days are too long. For example, Quy Nhon to Hoi An via the coastal route (avoiding Highway 1 as much as possible) is a long day, especially if you’re not used to riding in Vietnam. Also, Phong Nha to Ninh Binh is a very long distance to cover in one day. (Check sections 6-8 of this guide for possible places to break that journey). Hoi An to Hue (check this guide), and Ninh Binh to Hanoi are both fine. Bear in mind that all my guides try to take the most scenic routes between places, avoiding busy main roads as much as possible. If you want you can take more direct routes to cut down time and distance, however you’re experience of Vietnam’s roads and landscapes will not be as rewarding if you take the direct routes along the horrible highways. Super helpful! Coastal route looks good for us! 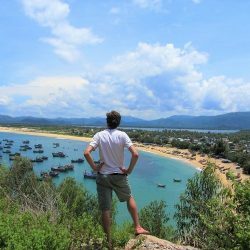 Any recommendations for places to stay between Quy Nhon and Hoi An? You can break the journey between Quy Nhon and Hoi An by staying at Sa Huynh beach, or Quang Ngai city, of My Khe beach (just east of Quang Ngai) or Tam Ky.
just an update, as of today (january 7th, 2017), the prices are: motorbike 170,000 vnd and passenger 186,000 vnd. For phan tiet, there is NO need to drain the gas tank, this is required for Saigon to Nha trang though. Thanks for the information. But are you sure about the two trains a day in each direction? I took this journey just a couple of weeks ago and, although the schedule says there are two trains in each direction, when I asked the staff at Saigon ticketing office, they told me that there is only one train. Apparently, they started the additional journeys but, due to bad ticket sales, they stopped it again. Also, if there are two trains a day now, perhaps that is just to accommodate the extra flow of people during the Tet rush. this was printed on a signboard on the sales counter at the saigon train station. i will ask specifically for tbese trains when i will travel next week. I stand corrected, your schedule is correct. In both railroad station they display two trains a day but in general only one is running every day. asked for a “handling fee” when storing my bike in tbe train … lucky me. Thanks for confirming that. It’s a shame, because an evening train from Saigon to Phan Thiet would be very convenient. Oh well, maybe they’ll start the extended schedule again someday. Great articles that will serve my trip this week! I am planning on buying a motorcycle in Saigon and heading toward the coast. I have 3 weeks, and to save time, I am considering loading my bike in Saigon and taking the train to Phan Thiet. From there, I will make my way up the coast and pass through Mui Ne, Dalat, Nha Trang, Quy Nhon, Hoi An, Hue, Phong Nha, and then trying to take a train to somewhere near Halong Bay where I will spend 3 days and attempt to cover what northern part of Vietnam I can on this trip(weather permitting). If weather does not allow, I may hop on a plane and make my way to Phu Quoc Island and spend a couple more final days in Saigon before flying out. Is my thought to transport my bike out of Saigon to Phan Thiet a wise one? Do you know anything about traveling with my bike from Phong Nha-Ke Bang National Park to Halong Bay? Thank you again for the vast material! 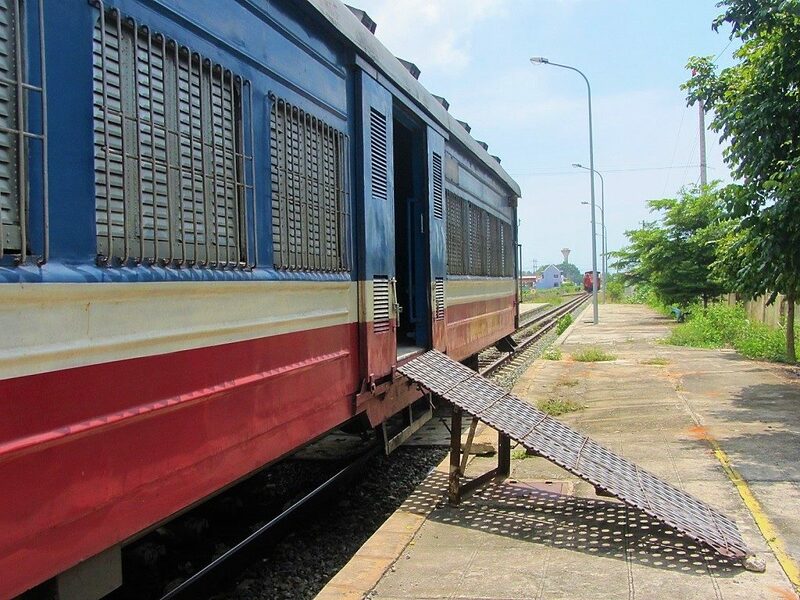 Yes, you can put your bike on the train to Phan Thiet – it’s quite easy to do that and it means you don’t have to ride out of Saigon, which is always busy. From Phong Nha to Halong Bay is a very long way. I would recommend staying on the Ho Chi Minh Road as long as possible and then turning east towards Hai Phong. For example, you can stay on the Ho Chi Minh Road to Lam Son, or Ngoc Lac, or Cam Thuy then turn east. After reviewing your weather article..and gathering recent weather reports, it appears as though traveling through Central Vietnam may be difficult at this time of year. I am wondering if I should stick to the south for the majority of my trip and do 5-7 days up north at the end. 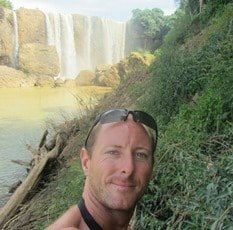 Would you see any problems if I were to continue with my original plan and attempt to cross central Vietnam on a motorbike? I don’t think you’d have any ‘problems’ – the typhoon season is ending about now. It just might be a little cold and grey. But, yes, if you want the best weather at that time of year, sticking to the south is a good idea. On the other hand, the mountainous landscape of central and northern Vietnam looks nice and mysterious in that kind of weather. I’m sure you’ll be happy whichever decision you make. what papers from the motorbike are required when doing this short or long shipping? When you put your motorbike on the train you will need to show your passport and your blue card, that’s it. They will give you a receipt – don’t lose it! Recently, my experience of putting my motorbike on the train has been very positive: just make sure you use Door to Door (they have an office in all the big stations) when shipping your bike on long distances. Does one need a blue card when transporting bikes from Saigon to Phan Thiet? We are renting bikes and not sure if we’ll get this card. I’ve never needed to show my blue/green card to take the bike on the Saigon-Phan Thiet train, so I think you’ll be fine. On the only longer haul trains you probably do need the card – although a couple of travellers recently said they didn’t. You mean riding to Phu Quoc, right? Yes, that’s a pretty fun ride as it takes you through the Delta and it includes the ferry ride too. Or for more variety of landscape and getting a little more off the beaten path you could ride some of my Tet Classic Loop. Hi Tom, thanks for all the brilliant info! I was planning to do this with my brother in May, but because of the recent bridge collapse they are not allowing motorbikes the train. We were planning on putting our motorbikes on the train and then driving back to Saigon along the coast. Doubtful, but do you know if there is anywhere in Phan Thiet where you can rent a motorbike and drive it back to Saigon and drop off there? I’ve heard of such things from Hoi-An to Hue etc. but not sure about Phan Thiet to Saigon as it’s quite far! Yes, the train bridge is a nuisance. I don’t know of any rental company that can arrange the drop off in Saigon. However, you could try contacting Saigon 2 Mui and Mui Go to see if they can work something out for you. It’s worth a try. 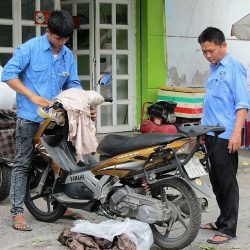 Also, I think Tigit Motorbikes (see the link to their site before this comment section) might be able to arrange it so that you pick your bike up in Phan Thiet and then drive to Saigon – again, it’s worth asking. I hope you get it sorted. What’s the story with bridge collapse? They are not accepting motorbikes on trains anymore all over Vietnam? I’m stuck in Sapa due to terrible rains since few days and if it would go on like this I was considering taking a train from Lao Cai to Hanoi. 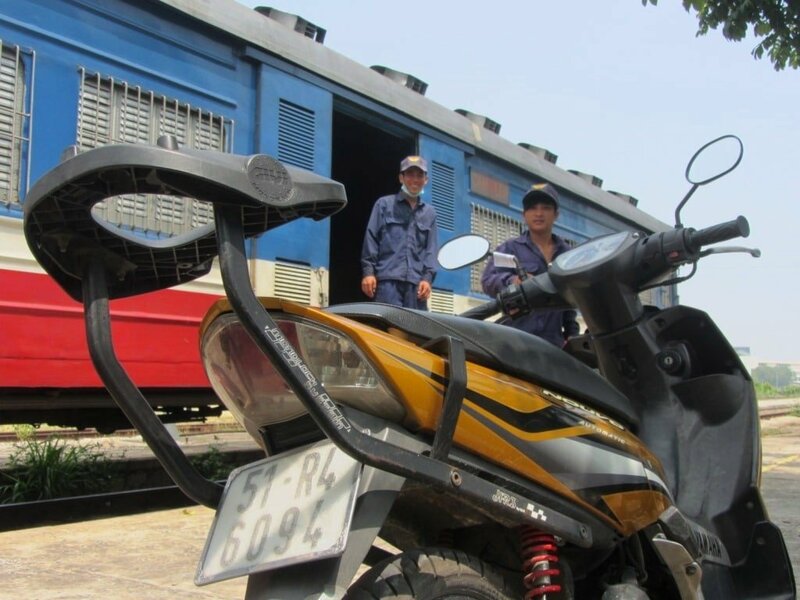 You can still send your motorbike on the train anywhere in Vietnam, it just takes about a day longer than it used to. I put my bike on the train from Hanoi to Saigon last month and it took 4 days; it usually takes 3. From Lao Cai to Hanoi shouldn’t be any problem. Oh dear 🙁 But, yes, the train is a good option. And how is AH14? The old road from Hanoi to Sapa? is it worth and safe taking it? I rode it last year – it was good; better than before, because now the new expressway takes most of the traffic. Ok, thanks, maybe I’ll try it. Yes. AH14 is quite interesting anyway. This make me think about story named The Great Railway Bazaar by Paul Theroux. It tells about a journey of traveller who visit oriental country by train. Yes, I’ve read The Great Railway Bazaar. 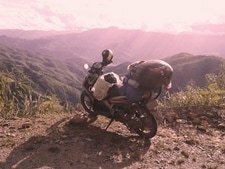 One of his favourite parts of his entire journey was the ride between Hue and Danang over the Hai Van Pass. Hi Tom. Do you know if the Hue to Danang train allows motorbikes on board? Cheers. Yes, you can. But your bike may not necessarily travel on the same train as you, depending on which type of train it is: if it’s a local train then it will, but if it’s one of the north-south ‘express’ trains then it probably won’t.